“Long in the tooth” is a condition where the patient starts experiencing more gum recession, which can be caused by multiple factors. 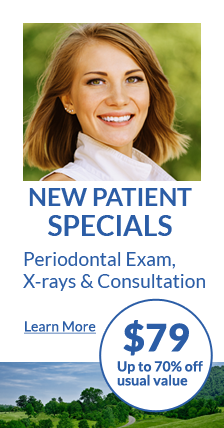 It can be either genetics or it can be some periodontal disease that leads to gum recession and bone loss. This process can lead to root caries and eventually start some movement in the teeth, and the patient may eventually lose the tooth. A “long tooth” condition can be treated successfully with gum grafts or bone grafts or a combination of both. Treatment of “long tooth” conditions are successful, with good, long term results. We actually have studies done all over the nation, showing that it’s stable for a long time and pretty much all of the patient’s life. In our own experience we’ve seen patients who had the gum graft procedure done and it was a successful, long-lasting treatment. If a patient needs gum grafting, as periodontists we are the ones who perform this procedure. We have the qualifications, the training and the research background to be able to perform these procedures with good, successful long-term results.